He says it was kind of his idea to create some tension between himself and Triple H during Evolution’s reunion at Smackdown 1000. He convinced Vince McMahon to work this in because he really wanted to see whether fans were still interested in him and Triple H. After the show Triple H told him, “get in shape motherf***er”, so he knew then that Triple H felt the energy too and wanted to do the match. Unfortunately, just a little while later he got a text from Triple H, informing him that he’d torn his pectoral muscle. Batista was disappointed and thought maybe this match was never meant to happen. However, leading up to ‘Mania he received another text, and Triple H said he’d be back in time for a match. The bout was back on. He says that Triple H really pushed his return for this match. Apparently Triple H was only cleared to return to the ring a couple of weeks ago, so he’s risking a lot to give Batista this moment, and Batista really appreciates that. Garcia wonders why Batista would risk everything to come back to the ring for one more match. 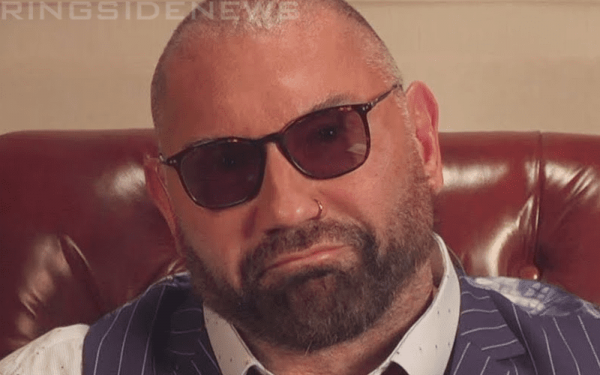 Batista says he’s been asked that a lot, but says it’s like having a loved one die without having a chance to say goodbye. He really needs closure from his wrestling career because he wasn’t happy with how his last run ended.